1. We don’t actually throw them “at” the birds. We throw them near the chickens so they will eat them. They need the calcium to produce more eggs. Sometimes if we find a stash we’re not sure about the age on we’ll just give them back to the chickens. How’s that for recycling? 2. The “girls” have a lovely set of nest boxes in their cedar-trimmed coop that they choose not to lay their eggs in. Finding where they are laying is like an easter-egg hunt every day. Today I was grooming my donkeys while one bird after the next proceeded to fly past me to the very top of a stack of new hay. Sure enough, after some acrobatics to get to the top of the pile I found the eggs. 3. One of those birds, (on the way to the secret nest) knocked the horse brush I was using for the donkeys between the giant stack of hay bales and the wall. Ever squeeze between the wall and 35 bales of hay? Not pleasant. 4. Sometimes we get eggs with double yolks. 5. Sometimes we get eggs with no yolks, (we call those our “low cholesterol” eggs). 6. Neither of these things is a problem. It’s just a glitch in their internal production line. 7. Our eggs are high in Omega 3’s because I feed them flax-seed in their mix, (chickens have gizzards that they store small stones and gravel in that grind up the hard outers shell so they don’t need it ground like people do). They also gain omega 3’s and other nutrients from foraging and eating what a chicken feels like eating. 8. Our egg yolks get more yellow in the summer than in the winter when the hens are able to go out and forage for their own food. 9. In the summer anything I make with our eggs is nuclear yellow. After a nice white cheesecake? Not gonna happen in the summer at our house. 10. Egg yolks are yellow because of caretenoids, (a form of vitamin A). I’ve read that the color of the yolk does not indicate it’s nutrition -only what foods the hen is eating. 11. Doesn’t the food you eat affect nutrition? In any regard, our eggs taste better than regular store eggs. 12. 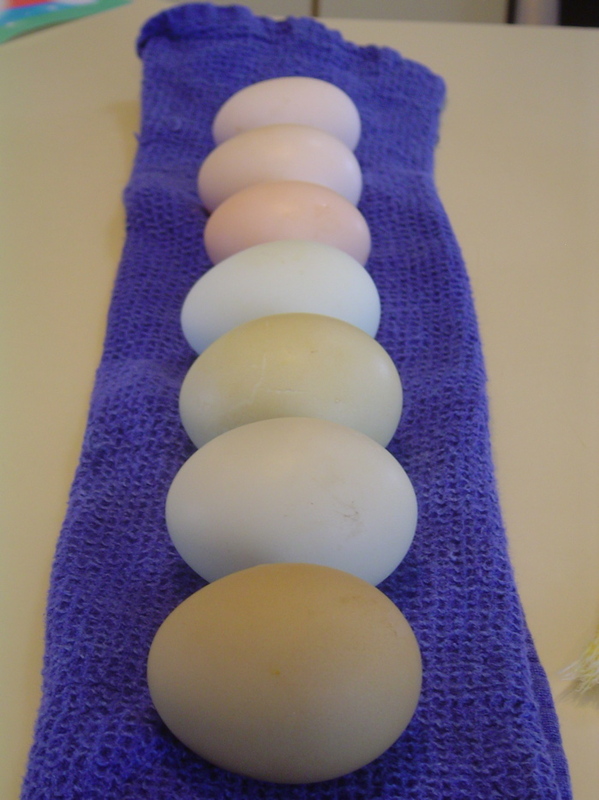 The color of the egg shell is dependent on the breed of the bird. So is the size. People tend to like nice brown eggs but white eggs from the same farm will be just as nutritious. Two birds of the same breed will lay the same color and size of egg, (within reason). 13. Did you know there are endangered chickens? Really. One of the somewhat endangered heirloom breeds we have is a Lakenvelder -a chicken from the Netherlands. Lakenvelder means “shadow on a sheet” in Dutch. They are black and white. -The craziest birds I’ve ever seen. They are also incredibly “feed efficient”. This means they consume very little to support themselves and their egg production. In the summer, they forage almost entirely and do not rely on the grain we offer. The last two “pinkish” eggs in the picture above are Lakenvelder eggs. 16. Cage free? This is redundant isn’t it? 17. High Omega 3? See #7 above. 18. Organic? Well, not certified but you can take my word for it. 20. 100% natural? I’m not sure how to answer this one. They are eggs. I’ve not had one lay a carton of egg-beaters. Nope. Never once. Well, that’s it for now. It’s time for bed.